One of the fifty American States, Missouri, has the motto "Show me". Nobody seems to know why the Missourans chose this simple request to represent them but it does suggest a down-to-earth, no-nonsense attitude to life that would be a great asset when wading through all the rumor and speculation of F1's silly season. Never mind all the talk, just show me. The silly season has been in top gear for several weeks now and it has been given a turbo boost by the Hamilton/Alonso incident in Hungary. "Alonso fed up and ready to leave McLaren" screams the press, "Ron Dennis says he can leave anytime", "Ferrari offers Fernando big pay out" suggest some. The denials are issued but it's too late now - we have the baton and are running with it. No wonder it is called the silly season. But it does illustrate how the anticipated move of a top driver can cause a blockage in movement throughout the pack. Last year everything hung on Michael Schumacher's rumored retirement and all changes had to wait until he made his announcement. This year it's Alonso's turn and team managers hold back from signing anything until they see which way the wind will blow at McLaren. Flavio suddenly delays any confirmation of his drivers, obviously hoping for a return of the prodigal son; Mario Theissen shows the wisdom of waiting until signing time before announcing any done deals, thereby allowing BMW to be a factor in the speculation. And then we have to think about who could take Alonso's seat. A straight swap with BMW? But Nick Heidfeld does not fit the mold of a McLaren driver; for reasons I do not understand, he is never regarded as champion material. Fisichella? Ummm, no, I don't think so. Much more likely would be a promotion from the lower ranks within the team, with either de la Rosa or Gary Paffett getting the nod. But that would not be as exciting as a reshuffle with other teams so it tends to get ignored. Everything is dying down now, anyway, as we realize that Alonso would be mad to leave McLaren at this stage. He is in the best car with only his team mate as serious competition (I'll support that statement in the Comments if you want to argue) - no matter how disgruntled he may be, it makes sense for him to hang on until this year's championship is decided and then have a think about the future. And next year I think he will still be in a McLaren; either that or retired. Going elsewhere can only diminish his chances of staying at the top. You see how easy it is to be infected with the silliness of the season? For a moment back there, when I mentioned the possibility of retirement, the thought of Paffett getting the drive popped into my head. Now that is something I would love to see, a straight fight between Gary and Lewis, but it's wishful thinking only. No doubt things will carry on as normal, with both Alonso and Hamilton still at McLaren, Quick Nick with a BMW contract in his back pocket and Fisichella replaced with Flavio's second choice (I wonder who that might be...). But no, I'll not be drawn. Renault will put their hopes in Kovalainen next year and the second seat really won't matter that much, I think. Although it is great fun to imagine all the possibilities of driver changes and new combinations, I'll stand with the Missourans on this one and just say, "Show me." I think this 3-week break hasn't helped the rumour mill as people have had too much time on their hands to think up these silly stories! I'm starting to get a little concerned that Alonso might just walk away from F1, either by retiring completely or by effectively doing so by heading off to America or somewhere else. I hope not though as he still has a lot to give the sport, and F1 would miss him. When the rumours first started about him leaving I couldn't see where he would want to go other than BMW or Renault and at either of those he is effectively taking a step back down the ladder rather than continuing upwards. I'm not a huge Alonso fan but the announcement that he was joining McLaren excited me at the prospect of what may be to come - the thought of Paffett or de la Rosa doesn't excite in the same way, no disrespect to those drivers! Alonso has hinted that he will retire early but I think next year is a bit sooner than he meant! I agree that most likely he'll remain with McLaren next year because there just aren't any decent alternatives available to him. And Hamilton will stay too, since he's been trained for it for so long, and that leaves us with the same situation - two drivers who both want to win, competing with each other like mad. Couldn't be better really, could it? The reason I'd like to see Paffett make the step into a race drive is because of his pre-F1 record. It is seriously impressive in a way that none of the drivers in lesser formulae are that Keith is writing about at the moment. I have a feeling that Paffett could be very, very good once given the chance. If he were to win a third title in a row do you think he would retire then? Its always better to quit in your prime and let people speculate. If he does decide to call it quits, he more then welcome to come to the States! I think Fernando said somewhere that he wanted to win three championships. So a third championship, coinciding with being stuck with a team mate likely to beat him in the near future, might be exactly the trigger to him leaving while at the top. It depends what his prime motivation is, I think. Does he love racing so much that he'd be prepared to carry on in a lesser car? David Coulthard is a good example of a man from that mold - he's still racing even though everyone thinks he should have retired some time ago. 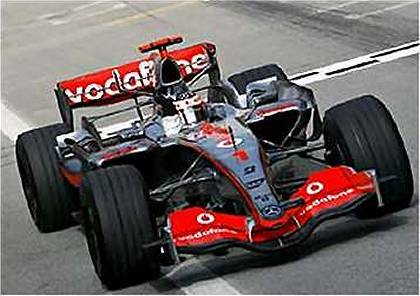 Or is Alonso more like Schumacher, in love with winning and unable to accept a lesser role? The answer has to be that he races only to win and that is why he can even talk about early retirement. He's the kind of guy who would never race just to bring a tail-end car up into midfield, as DC has done time and again. And so, yes, there's a chance he might duck out if he wins the championship. But I think the same reason would prevent him crossing the Atlantic to race in an American series. He would only do it for the best team and a lot of money. Far more likely is that he'd go off and start a multi-million business selling dodgy fashion items to the rich (Oh, Carlos Santana, how could you do it?) - anything that he could win at. Or have I become too cynical...? It will be unfortunate if he does retire, I have grown to like him over the past few years (I'm a Shu fan). I cant see him going to DTM or racing Le Mans either.... I don't know what he would do if he stepped down. Really, it's unlikely that Alonso will retire even if he wins his third championship this year. I mean, how old will he be, 24? That's very young to just give up on something that has been your life until then. It's an outside chance, that's all. The thing I find amusing in the Hamilton/Alonso "battle" is that Lewis has been applauded to the rafters and built up as this amazing rookie, but at the end of the day Alonso is only a year or two older than him - and is a double world champion already. To think that Lewis has won a few races, but no championships, and is getting the praise he is getting while Alonso is in the running for a third title on the trot and the subject of debate over whether he should retire or not is a bit crazy! Personally, I think the Lewis talk is over-hyped nonsense and Alonso retirement talk is possible, but unlikely. As with most things the truth lies somewhere in the middle and will probably see them both stay with McLaren for a year or two yet.